Ever since the original POREfessional primer from Benefit launched it has been my go-to priming product. It leaves my skin looking poreless and airbrushed, keeps shine at bay and locks my foundation in place - everything I look for and more when it comes to a primer. I have sworn by it since first buying and have probably gotten through five or six tubes since, as I just don't think anything else compares. So, when I heard that the babes at Benefit were bringing out another POREfessional product to add to their empire, I was immediately on high alert, waiting for news on its release. The news that it was a powder had me even more excited - whilst I'm more than happy with my powder of choice at the moment, if the original POREfessional was anything to go by, this powder was going to answer all my shiny-faced prayers. 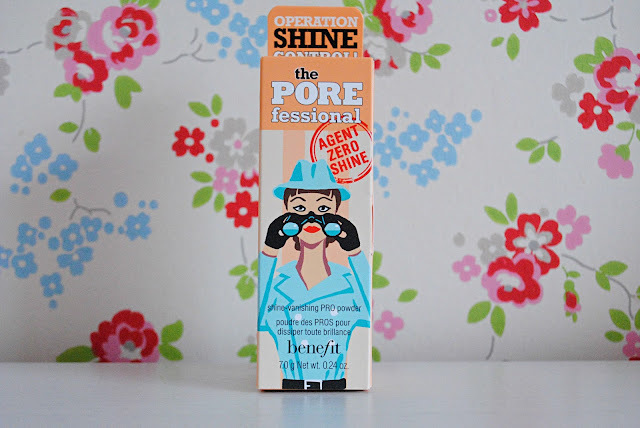 I was lucky enough to be sent the powder in question, Benefit's new POREfessional: Agent Zero Shine powder, although I had every intention of buying it upon its release anyway. Anything with POREfessional in the title has me hooked, and over the past few weeks I've been testing the powder to see just how it performs. First of all, I love the packaging of this little baby. Benefit always delivers when it comes to quirky colourful packaging, and of course, we welcome back POREfessional's SpyGal to fly the flag for banishing pores and getting rid of shine. The box is so cute, it even opens up to reveal a pretend SpyGal Action Figure (such a fun touch), and once opened the tall-but-small pot of powder stands pride of place. The pot is really nifty - it features a twist-out brush at the bottom and you turn the top to empty out the powder into the lid, meaning this is ideal for using on-the-go. The product itself, like the primer, goes on transparent, despite having a slight skin-coloured tint to it. It feels incredibly soft and fine on the skin, so it's easy to see how it gets rid of shine. Obviously, it's a loose powder, which is my favourite for tackling shine, but can obviously be a bit of a pain to carry around. Therefore this is the perfect solution for having in your makeup bag on-the-go, or for a night out on the town. Do I love it? Unfortunately, I'm left a tad disappointed by this product. Whilst it's good, it isn't great, and it doesn't deliver anywhere near the results that its partner-in-crime, the original POREfessional primer, does. It is good for keeping shine at bay, but I probably wouldn't choose it over my go-to powders. Considering it is titled 'POREfessional', it really doesn't do much in the way of minimising pores. 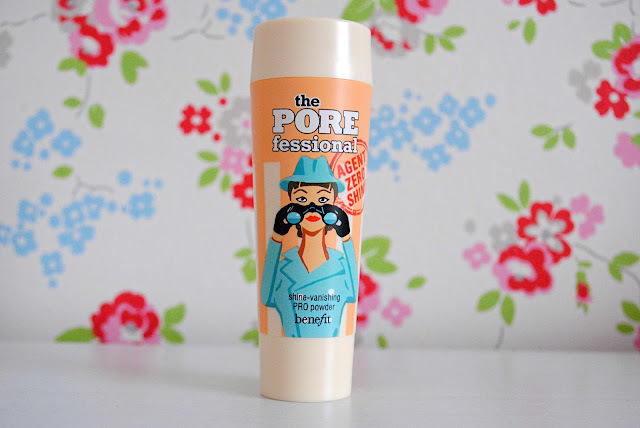 I think Benefit knew they were on to a good thing with the POREfessional range, after it's predecessor's success, but unfortunately this product doesn't cut it in the pore department. Whilst it does mattify the skin and keep oil under control, it does not make the tiniest bit of difference where pores are concerned. To add to this, I find the brush is too small and dense to sweep over the face properly, and the powder slightly too fine to create the full coverage I like. Whilst I love the travel-friendly aspect of this product, unfortunately I expected a lot more from it. 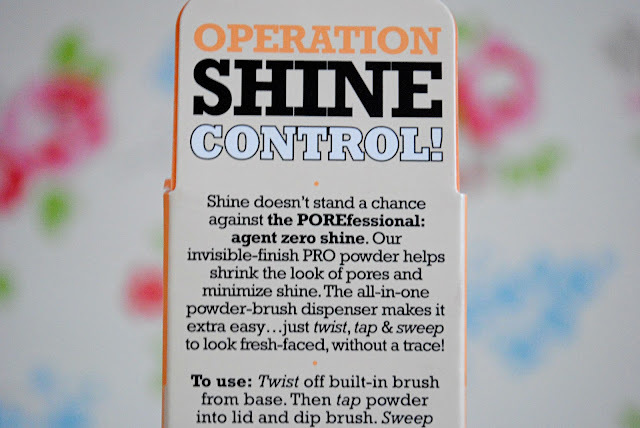 Overall I think the new POREfessional: Agent Zero Shine is a good powder. It's great for using on-the-go, definitely helps to mattify the skin, but unfortunately I wasn't wowed by it. For £23.50 I really expect to be wowed, so I'm not entirely sure it's worth it if you're looking for a new Holy Grail powder product. 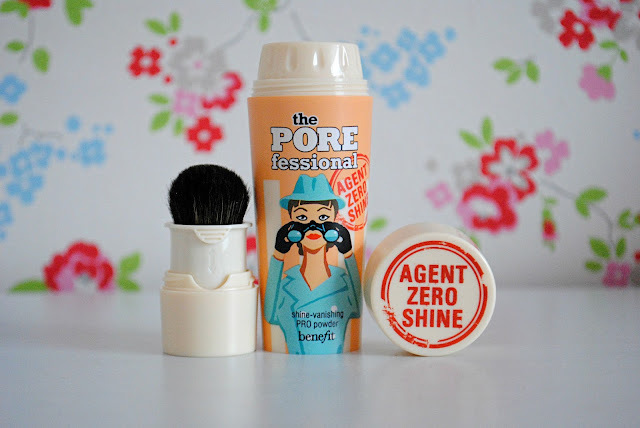 Have you tried the new POREfessional: Agent Zero Shine? What did you think to it?